On Wednesday 7th July Southwark Council has agreed to the terms of the Regeneration Agreement with Lend Lease, allowing for the £1.5bn transformation of the Elephant and Castle to begin. Unfortunately, the agreement is not available to public scrutiny “as it contains commercially sensitive information”. 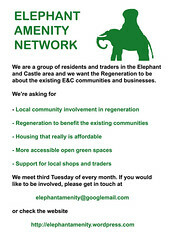 Although the main points of the development proposals can be found in the Master Regeneration Plan (MRP – scroll down to item 9 Elephant and Castle – Regeneration Agreement and Disposal of Associated Land) , this is “to be considered a draft document” that is meant to evolve and change “in order to take into account the requirements of the development timeline for the Elephant and Castle”. This means that the full details of the regeneration plan are not yet in the public domain, and that local stakeholders such as residents and shopowners are yet to be informed about items of public interest such as actual percentages of affordable and social housing, public services and amenities, and health hazards like the asbestos removal before the demolition of the Heygate. Moreover, the demolition of the Heygate will require chopping down 450+ mature trees on the site – a veritable urban forest at the heart of Elephant, as can be seen from this aerial view. Yet there is no mention of this in the MRP. Who will be able to join the steering group and how will this reflect the needs and desires of local stakeholders? More local amenities are under threat as Southwark Council plans “to destroy large parts of Burgess Park and use the Aylesbury £4 million to bulldoze the park and replace it with “A purpose built space for some of the largest festivals in Europe with amphitheatre style viewing for over 100 thousand people, a floating stage, and a dedicated cultural hub“. Lib Dem has lost four seats in Elephant and Castle wards at the recent local elections and Southwark now has a new Labour administration – what does this mean for the regeneration? The Evening Standard has its own point of view: read it here.